Since Toolbar Extras version 1.4.0 you can customize the “Howdy/Welcome” on the top right corner. This is the Toolbar item for your user account/ profile. Decide if you want to tweak this Toolbar item or not. By default it is disabled – so it’s like a regular WordPress install. Only if you decide to tweak things, then it will be possible. This will just remove this one word and you can use whatever you want instead of it. The structure of the sentence is kept, however. With this option you can use a completely custom string. Here you can set your own URL that is used to link the welcome text string. 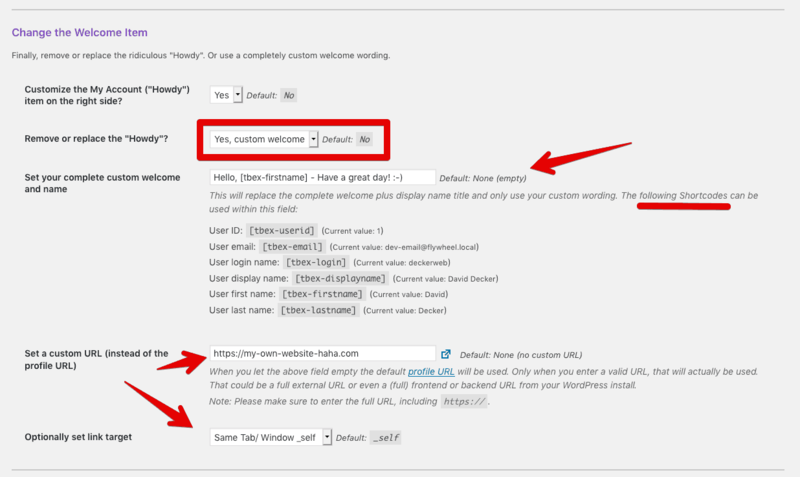 By default this points to your user profile settings within the WordPress admin. But you can use any valid URL here, and also set the link target (_self or _blank).